An all-natural blend that can help support the management of a normal inflammatory response. 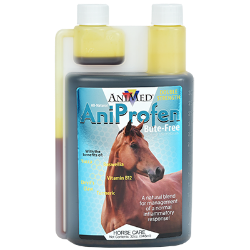 Helps your horse’s joints manage the stress of riding, jumping, and shows. Give your horse the joint support he needs to stay healthy and agile, today and in the years to come. With beneficial ingredients like yucca, boswellia, vitamin B12, and turmeric. Powerful, double-strength formula to help maintain cartilage and joint health. Bute Free! Dosage: Administer 1 fluid ounce once to twice a day for an average 1100 pound horse. Adjust according to body weight.